Trade to the Low Countries. HODIE 3a vice lecta est Billa, for the putting down of Gigg-Mills, que communi omnium Procerum Assensu conclusa est. Hodie 3a vice lecta est Billa, for the limiting of Times to buy and sell Wools, que communi omnium Procerum Assensu conclusa est, dissentiente tantummodo Comite Sussex. 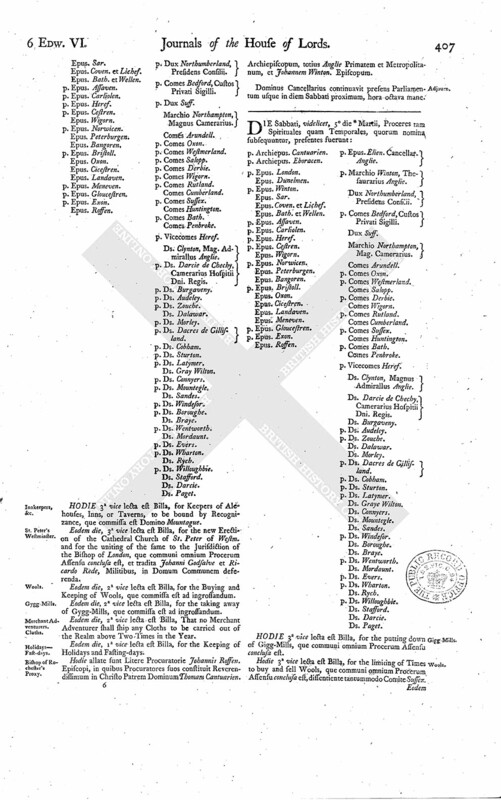 Eodem die, 1a vice lecta est Billa, for the Repealing of an Act made in the Twelfth Year of King Henry the Seventh, for Merchants having Recourse of Merchandizes into the Low Countries. Eodem die, 1a vice lecta est Billa, for the Restitution in Blood of Harry Nevyll, Richard Nevyll, and Francis Nevyll, que commissa est Attornato Regis. 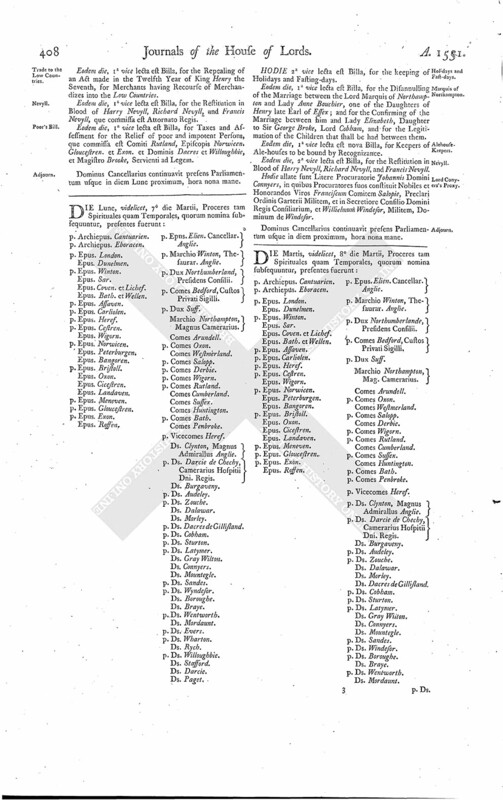 Eodem die, 1a vice lecta est Billa, for Taxes and Assessment for the Relief of poor and impotent Persons, que commissa est Comiti Rutland, Episcopis Norwicen. Gloucestren. et Exon. et Dominis Dacres et Willoughbie, et Magistro Brooke, Servienti ad Legem.